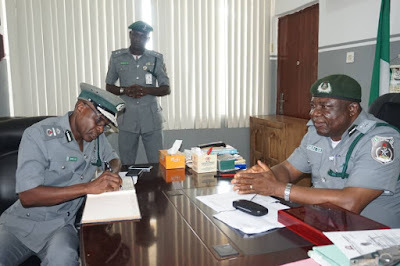 The Ogun State Area of the Nigeria Customs Service says it made about 298 seizures with Duty Paid Value (DPV) of over N1.5 from January to July, 2018. The Area Controller, Michael Agbara, disclosed this to newsmen at the Idiroko border town of Ogun state. He also revealed that the command has seized over 20,000 thousand illegally smuggled foreign rice during the period under review. Giving further breakdown, the controller said the command seized 618 of frozen poultry products, 1,643 of 25 litres each of vegetable oil, 254 units of vehicles, 30 motorcycles, 49 sacks and 32 bales of second hand clothing, 164 compressed book packs, 8 sacks and 85 coconut packs of Cannabis Sativa (Indian Hemp) as well as 624 kegs of premium motor spirit, otherwise known as petrol. He said, “on rice smuggling in the year 2017, a total of 21, 789 bags of rice were seized from January to December. But with the command’s reinvigorated efforts, a seizure of 20,574 bags of rice have been recorded with the period of January to July, 2018. “The above success story is an indication of full commitment of the command towards achieving the laudable policy of the present government in enhancing local rice production. “Suppression of smuggling is a core mandate of the Nigeria Customs Service and it is fought with daunting challenges in the Ogun Command”. Agbara stated that the command has received authorization from the headquarters to release some seized (perishable) items to the Nigerian Army Corps of Supply and Transport for onward delivery to Internally Displaced Persons in Borno state. He said this would create more space for fresh seizures. The Controller however enumerated some of the challenges being faced by the command to include inadequate barracks accommodation, scanning operation, need for modern baggage hall in Idiroko and need for landscaping of Idiroko premise and Abeokuta to prevent further damage due to gully erosion. Other challenges as mentioned by the Controllers are lack of modern clinic, inadequate number of operational vehicles, inadequate officers amongst others. He said that the command will soon commence the retraining of officers on arms handling in the collaboration with military formations within the state. Agbara assured that the command will continue to work assiduously to enhance its core functions of revenue generation, suppression of smuggling and facilitation of trade.